Ford Motor Company and Autonomic have signed a multi-year, global agreement with Amazon Web Services (AWS) for cloud connectivity services and connected car application development services for the transportation industry. Autonomic is developing a Transportation Mobility Cloud (TMC) powered by AWS that will become the standard connected car solution for Ford vehicles. The solution will use the breadth and depth of AWS’ portfolio of services, including Internet of Things (IoT), machine learning, analytics, and compute services. Ford Motor Company announced its acquisition of Autonomic, a start-up based in Palo Alto, California that is developing an open cloud-based platform "for connecting and empowering tomorrow’s mobility systems." Financial terms were not disclosed. Autonomic said it is working on building blocks for smart mobility applications and services. Ford said the acquisition will accelerate the automaker’s mission to establish the Transportation Mobility Cloud platform and support its plans to scale up other key mobility initiatives, including the drive toward full connectivity, Chariot and non-emergency medical transportation. Ford also announced the acquisition of TransLoc, a Durham, North Carolina-based provider of demand-response technology for city-owned microtransit solutions. Baraja, a start-up based in Sydney, with offices in San Francisco and China, announced $32 million in Series A funding for its Spectrum-Scan LiDAR for autonomous vehicles. In July, Baraja launched a novel LiDAR system that uses prism-like optics and shifting wavelengths of light. By changing the wavelength of the laser, the system can scan different angles instantaneously. The design eliminates the need for spinning lasers. The funding was provided by Sequoia China, Blackbird Ventures, and the CSIRO Innovation Fund managed by Main Sequence Ventures. NXP Semiconductors has acquired OmniPHY, a provider of automotive Ethernet subsystem technology. Financial terms were not disclosed. 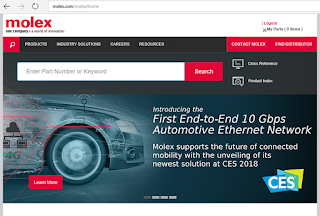 NXP said OmniPHY's interface IP and communication technology along with NXP’s own automotive portfolio will form a “one-stop shop” for automotive Ethernet. The companies’ technology synergies will center on 1.25-28Gbps PHY designs and 10-, 100- and 1000BASE-T1 Ethernet in advanced processes. "We are very excited to join NXP – a leader in automotive electronics, for a front-row seat to the autonomous driving revolution, one that will deliver profound change to the way people live,” said Ritesh Saraf, CEO of OmniPHY. 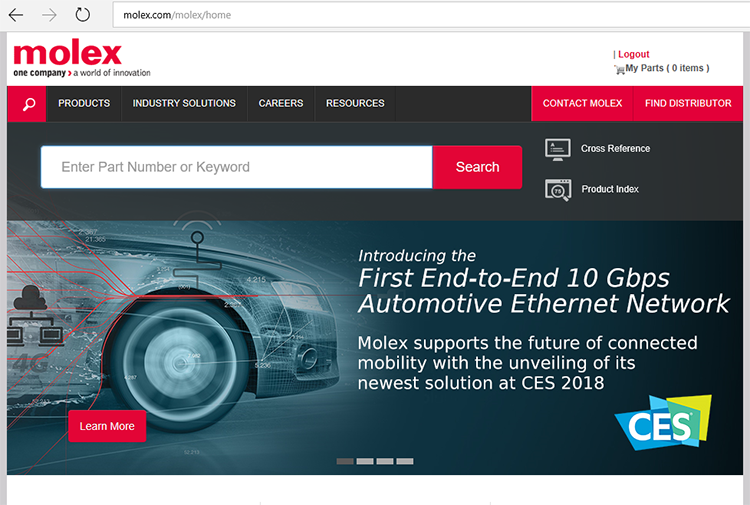 “The combination of our teams and technology will accelerate and advance the delivery of automotive Ethernet solutions providing our customers with high quality and world-class automotive Ethernet innovation." Baidu will integrate Mobileye’s Responsibility Sensitive Safety (RSS) model in its open source Project Apollo and in its commercial Apollo Pilot programs. Baidu will also adopt Mobileye’s Surround Computer Vision Kit. “Our team recognizes the value and critical role that Mobileye’s RSS model plays in safely deploying autonomous driving. Project Apollo will integrate RSS to successfully enable safe driving today, and drive further autonomous research on China’s roadways,” stated Weihao Gu, general manager of Baidu’s Intelligent Driving Unit. Nuro, a start-up based in Mountain View, California, will work with Kroger, one the largest grocery store chains in the U.S., to test a fully-autonomous vehicle for home delivery service. Nuro said this is the the first application test for its autonomous vehicle hardware and software. The pilot testing is expected to begin this fall. "Unmanned delivery will be a game-changer for local commerce, and together with Kroger, we're thrilled to test this new delivery experience to bring grocery customers new levels of convenience and value," said Dave Ferguson, Co-Founder, Nuro. " Nokia and KDDI have conducted a series of tests in Japan to assess the use of 4G LTE for low-latency connectivity for vehicles. For the proof-of-concept trials in Japan, Nokia and KDDI focused on vehicle to network use case and used non-integrated systems in cars interacting with sensors via the Nokia Multi-access Edge Computing (MEC) platform, which enables significantly reduced network latency. The testing included LTE broadcast, implementing the evolved Multimedia Broadcast Multicast Service standard in two connected car applications, and demonstrating the potential of cellular technology to enable fully automated driving in the future. Ambarella also demonstrated a fully autonomous EVA (Embedded Vehicle Autonomy) vehicle on Silicon Valley roads. 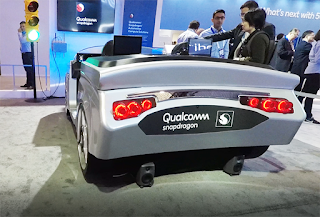 Ambarella's autonomous car leverages the company's embedded computer vision processors. The company said its EVA’s high-resolution stereovision cameras deliver the 360-degree short and long distance viewing capability required for advanced perception and precise self-location. EVA includes sensor fusion of the vision information with Radar and map data to provide the information necessary for path planning and merging maneuvers without the need for additional LiDAR systems. 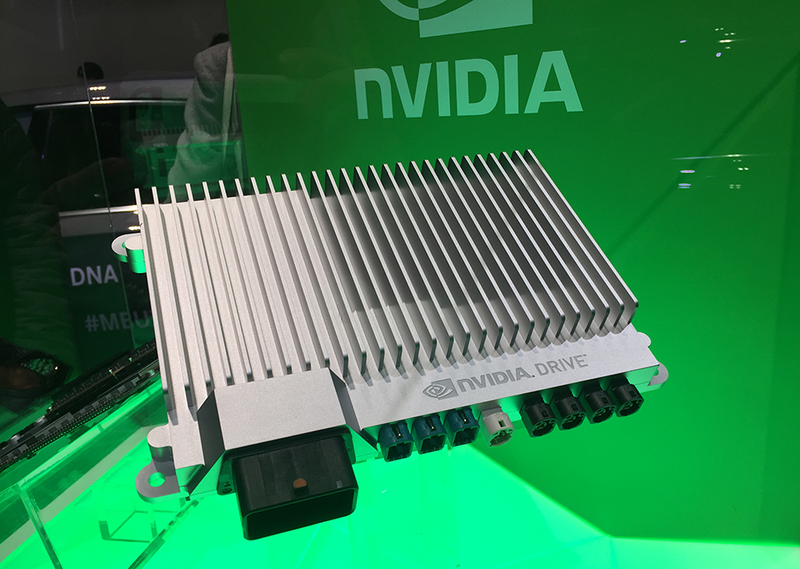 Marvell confirmed that its 88Q5050 secure automotive Ethernet switch is integrated into the NVIDIA DRIVE Pegasus platform for autonomous vehicles. 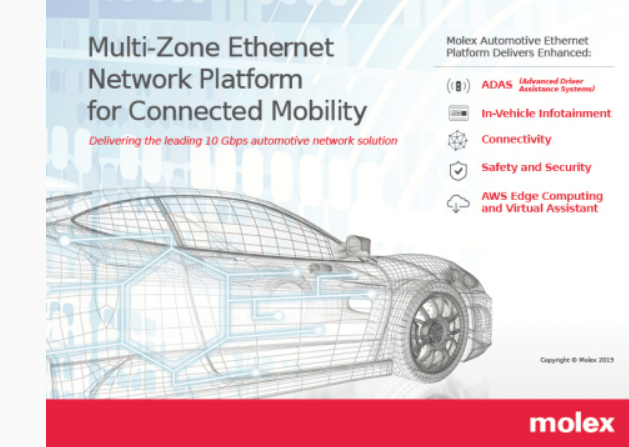 Marvell said its secure switch can handle multi-gigabit applications for OEM car manufacturers to deliver an in-car network that supports sensor fusion, cameras, safety and diagnostics. Its switch design employs a deep packet inspection (DPI) engine and trusted boot functionality to ensure a robust level of security. The switch also supports both blacklisting and whitelisting addresses on all its Ethernet ports to further enhance its security especially against denial of service attacks. The NVIDIA DRIVE Pegasus computing platform has been designed to handle Level 5 driverless vehicles and compute over 320 trillion operations per second. The platform combines deep learning, sensor fusion, and surround vision to understand what’s happening around the vehicle in real-time. The Marvell 88Q5050 layer 2 managed secure IP switch enables the fast and safe transmission of this data for next generation connected vehicles. “The 88Q5050 is Marvell’s latest addition to the automotive portfolio of wired and wireless network solutions and is designed to prevent malicious attacks or compromises to data streamed in and out of the vehicle. Marvell has over 20 years of Ethernet IP experience and this partnership with NVIDIA demonstrates our continued commitment to innovating and leading in automotive technology. Marvell is excited about the future of automotive and will utilize its extensive portfolio to accelerate the adoption of automotive Ethernet,” said Thomas Lagatta, executive vice president of Sales and Marketing at Marvell.